I would bet that you are an honest and forthright person. You don’t cheat at Monopoly, you pay your taxes on time, you’re a decent tipper, you don’t take up two parking spaces at a time, etc. But the second someone starts to look for a job at your company, the trust dissipates like fog as the sun rises. 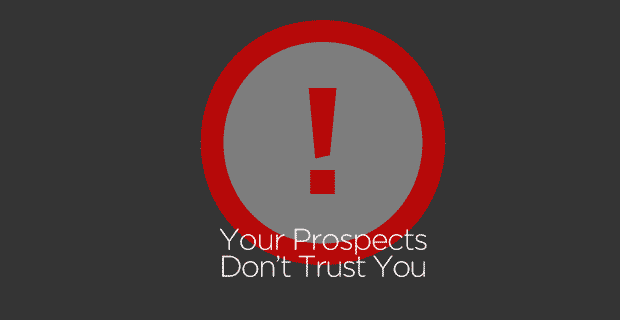 The simple truth is that your prospect doesn’t trust you. They can see you working overtime to hide anything interesting or authentic about your company, about the department or the job. There’s almost nothing on your career site a team of rabid lawyers haven’t rewritten for you. You don’t participate in online conversations about what working at your company is really like. You don’t answer the comments left on your Facebook page, and anything negative gets deleted immediately. When was the last time you answered someone’s question on Twitter? Or Quora? Or Glassdoor? You beg them to sign up for your talent pool so that you can foist more jobs on them – jobs that may or not be a match to who they are, what they need to succeed, or even to their skills. The emails with jobs can’t be replied to. So they signed up and get a wall of cricket chirps punctuated by noise that matters a lot more to you than them. We all know this is how “the game” is played, but who really wants to play it any more? We all know this is how “the game” is played, but who really wants to play it any more? All the benefit is on your side, and almost none on theirs. Your recruitment software is geared towards capturing the resumes of thousands of kids just graduating, not to facilitating understanding (in either direction) or communication. It is a wall you hide behind, cowering in fear that they might learn that you don’t have a world-class benefits package, that they’ll end up working long hours, that you won’t shower them in cash, that your company is pretty much mediocre managers from top to bottom, that your mission statement is pretty much a bunch of words that no one cares about, that your commitment to diversity or the environment or education is 98% marketing and 2% reality. You want them to give up their career history, including salaries and contact information for former bosses. What do they get in return? A form letter? A boilerplate email sent months after they applied? Silence? You and your career site are asking them to change their entire lives. Even if they don’t relocate, changing a job requires a great deal of emotional work. But when you ask that of them, you refuse to give a compelling reason why. If I asked you for $20 and didn’t tell you why, would you give me your money? Or more meaningfully, would you trust me? No wonder no one trusts you. You ask for everything and give almost nothing in return, not even an honest answer. It isn’t until they get hired that they get to learn the deep dark truth, too late to change course. What if the next revolution is not about technology but about trust? What if the revolution we’re seeing all around us isn’t about mobile technology or social networks? What if that’s just window dressing for a far more fundamental shift you can feel at every level, not just for recruiting and talent acquisition, but for consumer and corporate marketing? What if the next revolution is not about technology but about trust? Maybe that’s why Google is beloved. Maybe it’s not the food and coffee and massages, but the fact that hundreds of millions of people trust them to handle their emails, their pictures, their connections, their locations, and their searches. Maybe Google is the most desirable place to work because it is one of the most trustworthy company, something that’s written into their code, their apps, and in the software and services they give away. It’s in the books they write about what working at Google is really like. It’s in the way they give away what they’ve learned instead of hiding it. In the next two years, trust will become the dominant factor that determines if you are attracting the best people or just the also-rans. Companies like Automattic, Zappos and Buffer will reveal almost anything about them you want to know (including how they calculate salaries). And you bend over backwards to keep from saying anything meaningful. Who am I to trust more? In the next two years (if that long), trust will become the dominant factor that determines if you are attracting the best people or just the also-rans. Your career site presence, bereft of content, interaction and authenticity, is only begging the best people to run away. And that’s exactly what they are doing. They just don’t trust you because you never gave them a reason to.